Industrial production accelerated by 3.4% in June or 6.9% in working-day-adjusted (WDA) terms. The better than expected print came on the back of double-digit growth in production of electricity, which added 1.3 percentage points to annual growth. In this subsector, however, almost 17% of the year-on-year change was due to a low base following shutdowns in the Temelin nuclear plant last year. The manufacturing industry itself added 2% YoY, which was slightly below the year-to-date (YTD) average growth of 3.7% YoY, i.e. in line with growth in the car segment at 2% YoY in June. New orders accelerated by 5%, which is slightly above this year’s average. Industry has been gradually decelerating this year and added just 2.8% YoY in 1H18 after a strong 6.5% in 2017. This was driven by the high base, limited capacity and weaker foreign demand together with a deceleration in the car segment, which had previously been strong. We expect Czech industrial production to maintain a similar pace in 2H18, i.e. growing around 3% this year. This would still be a positive figure in the context of recent data and uncertainty surrounding the escalation of trade wars. Retail sales slightly disappointed, growing just by 2.0% YoY (3.2% WDA YoY), while the 2018 average growth rate was above 5%. 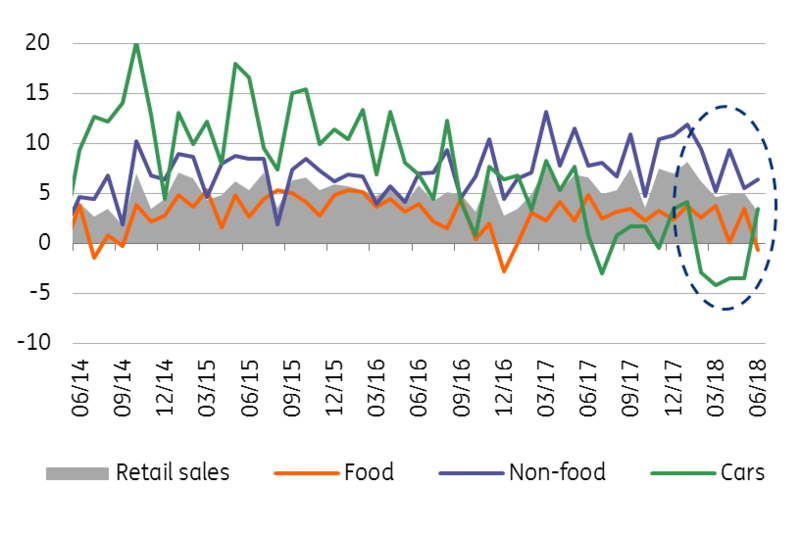 The weaker reading was mainly caused by a YoY fall in food sales, partially driven by a high base in June 2017, where both the highest YoY and MoM food sales were recorded last year. Sales of food have been rather volatile lately, so the June decline is no surprise. Non-food sales slightly decelerated to 4.7% YoY in June, which is weaker compared to what we saw in the last 12 months (8% YoY dynamics on average). But they remain solid and in working-days-adjusted terms, are only slightly below the 2018 average. All in all, consumer sentiment remains strong and household consumption will be the main growth factor this year. Will car sales improve after weak first half? Car sales stagnated in June, but adjusting for a lower number of working days, they accelerated by 3.5%. This is the first YoY growth since January. We believe that the annual fall seen in 1H18 was partially caused by a high base from 1H17 due re-export activity, as parts of new cars were registered in the Czech Republic but directly re-exported abroad, according to some anecdotic evidence. This was a profitable activity due to a weak Czeck koruna during the CNB FX-floor regime. However, following the end of this policy in April 2017 and a strengthening CZK, this activity declined, leading to more “natural” numbers of newly registered cars in the Czech economy. We will see whether car registration prints continue to improve in coming months, which would suggest that the effects of re-exports had a role, but other one-off factors related to new emission rules might also negatively affect the market.